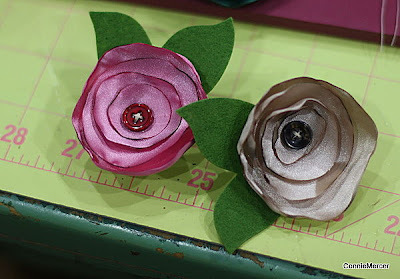 crafty goodies: Satin homemade flowers ~tutorial! I wanted to post how I made the satin flowers yesterday but I ran out of daylight~so I got it done today. They are really fun to make and will look fabulous as hair bow clips, embellishments on scrapbooking pages and altered projects. I made these into hair bow clips for my little girl peeps!! 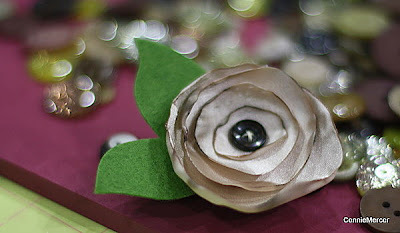 I sewed a button in the middle of the flower and then glued the clip part on the back. I used Helmar 450 Quick Dry for this. After I finished I thought sewing around the green leaves would look neat too!! I'll to try that on the next ones. This is how I finished the back out. 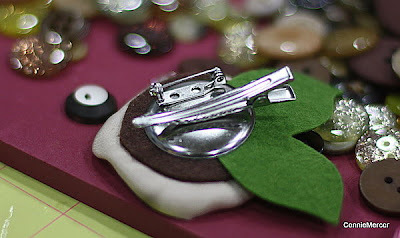 For you local peeps I got the leaves and clips at Craft Crossing. These will look super cute in the little girl peeps hair!!! Thanks for stopping in~I will be up on Helmar's Blog tomorrow would love the support. We are partnering with The Robins Nest. Have a great day and see ya soon!! Great tut on the flowers! Who would've thought to singe the edges! WOW! Very cool - thanks! I need to make some of these!!! ADORABLE!! Just gorgeous Connie! On a side note, I tried emailing you, but I think it bounced back - can you let me know if you received it? Thanks!! ohhhhhh woweeeeee... these are GORGEOUS!!! I like how you pictured all of your supplies, etc. These are so pretty, Connie! Love the tutorial. Wow Connie those are gorgeous!! Too adorable. I agree with Margie H...who would have thought to singe the edges. Love it. Thanks for joining my Blog Hop!! Love that, too. Be sure to let your followers know by blog post if that works for you. Cute! 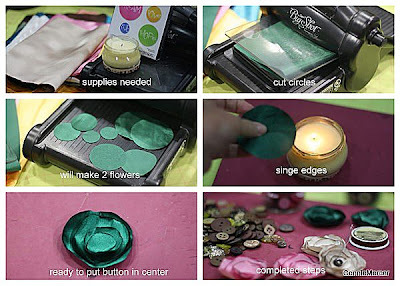 I've always used a heat tool to burn my flowers, really like the idea of using a candle much more!! The browned edge is too cool, you can control the burning much better. Thanks for sharing! Great tutorial.